Build better relationships and Sell More Effectively With a Powerful SALES STORY"Throughout our careers, we have been trained to ask diagnostic questions, deliver value props, and conduct ROI studies. It usually doesn't work; best case, we can argue with the customer about numbers-purely a left brain exercise, which turns buyers off. This book explains a better way. "-John Burke, Group Vice President, Oracle Corporation"Forget music, a great story has charm to soothe the savage beast and win over the most challenging customer. And one of the best guides in crafting it, feeling it, and telling it is What Great Salespeople Do. A must-read for anyone seeking to influence another human being. 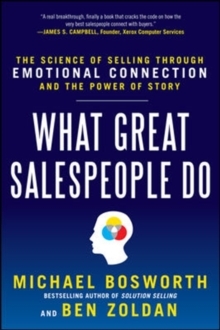 "-Mark Goulston, M.D., author of the #1 international bestseller Just Listen: Discover the Secret to Getting Through to Absolutely Anyone"Good salespeople tell stories that inform prospects; great salespeople tell stories that persuade prospects. 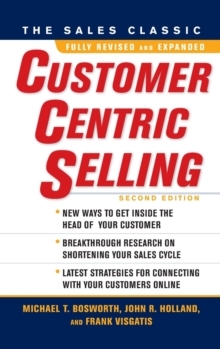 This book reveals what salespeople need to do to become persuasive story sellers. "-Gerhard Gschwandtner, publisher of Selling Power"This book breaks the paradigm. It really works miracles! "-David R. Hibbard, President, Dialexis Inc (TM)"What Great Salespeople Do humanizes the sales process. "-Kevin Popovic, founder, Ideahaus (R)"Mike and Ben have translated what therapists have known for years into a business solution-utilizing and developing one's Emotional Intelligence to engage and lessen the defenses of others. What Great Salespeople Do is a step-by-step manual on how to use compelling storytelling to masterfully engage others and make their organizations great. "-Christine Miles, M.S., Psychological Services, Executive Coach, Miles Consulting LLCAbout the Book:This groundbreaking book offers extraordinary insight into the greatest mystery in sales: how the very best salespeople consistently and successfully influence change in others, inspiring their customers to say yes. Top-performing salespeople have always had a knack for forging connections and building relationships with buyers. Until now, this has been considered an innate talent. 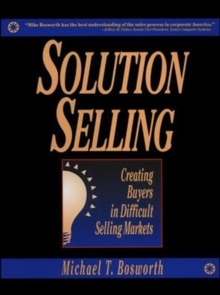 What Great Salespeople Do challenges some of the most widely accepted paradigms in selling in order to prove that influencing change in buyers is a skill that anyone can learn. The creator of Solution Selling and CustomerCentric Selling, Michael Bosworth, along with veteran sales executive Ben Zoldan, synthesize discoveries in neuroscience, psychology, sociology, anthropology, and other disciplines, combining it all into a field-tested framework-helping you break down barriers, build trust, forge meaningful relationships, and win more customers. 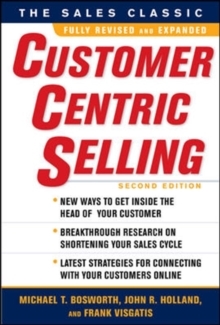 This book teaches you how to:Relax a buyer's skepticism while activating the part of his or her brain where trust is formed and connections are forgedUse the power of story to influence buyers to changeMake your ideas, beliefs, and experiences "storiable" using a proven story structureBuild a personal inventory of stories to use throughout your sales cycleTell your stories with authenticity and real passionUse empathic listening to get others to reveal themselvesIncorporate storytelling and empathic listening to achieve collaborative conversations with buyersBreakthroughs in neuroscience have determined that people don't make decisions solely on the basis of logic; in fact, emotions play the dominant role in most decision-making processes. What Great Salespeople Do gives you the tools and techniques to influence change and win more sales.